BNP Paribas has been a part of the American fabric since the mid-1800s, and today the US represents the Bank’s second largest market after France, and an important piece of the Group’s 2020 ambitions. 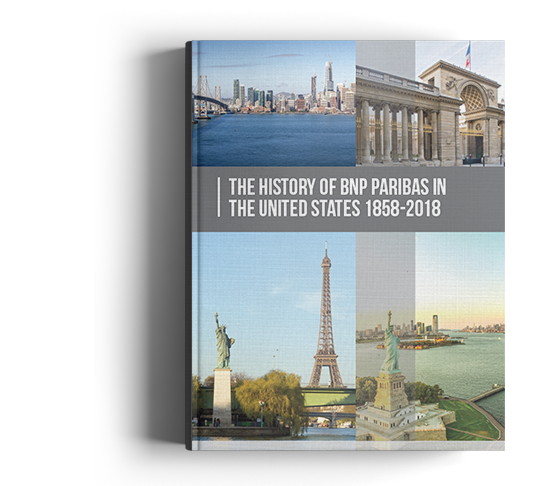 To celebrate our rich and ever-expanding history in the US, we are pleased to announce the publication of the book The History of BNP Paribas in the United States: 1858-2018. This book recounts BNP Paribas and Bank of the West’s steadfast commitment to our clients and investment in the US. It is our hope that The History of BNP Paribas in the United States: 1859-2018 will provide greater insight into the Group’s US presence and role in the American story, and deepen our pride in BNP Paribas as we look ahead to our next chapter in the United States as the bank for a changing world.